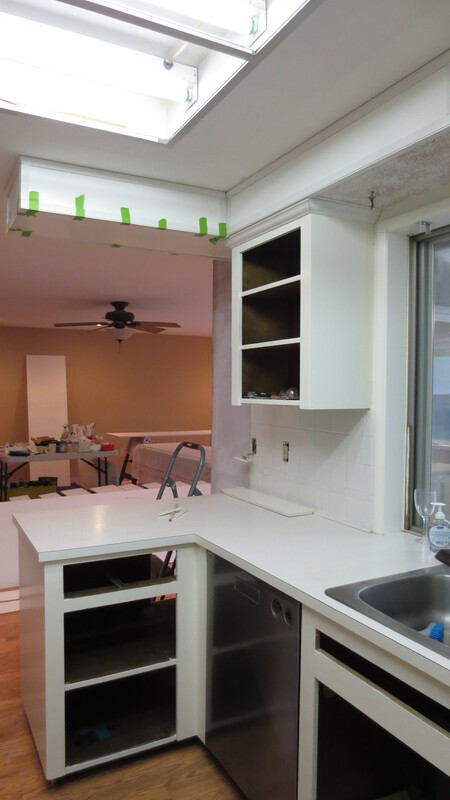 5745 House Update: Trim, Trim, Trim! This weekend’s focus was painting trim- filling nail holes, replacing caulk around windows, painting window sills and every single inch of trim around the floors and doors- most with 3 coats. And apparently didn’t brush her teeth that morning. Here’s two of the finished bedrooms (new paint- one room used to be clay brown bottom half and a bright red top, the other was clay brown bottom half and bright blue top. Closet jambs used to be dark wood (typical of 1970’s homes). 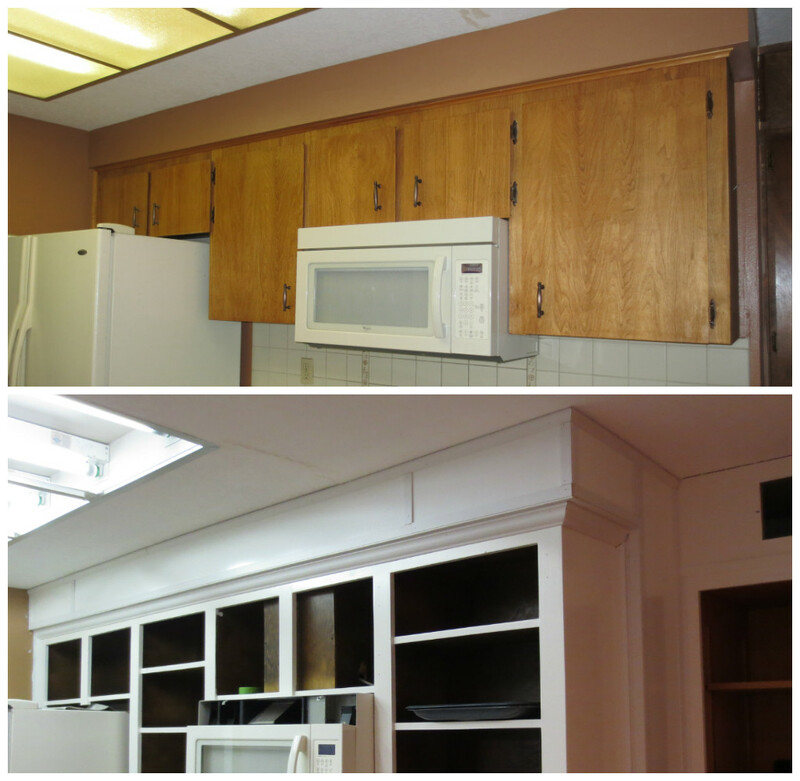 We painted those white, painted the closet interiors white, and painted all the trim white). Chair rail has been painted but still hasn’t been hung. Chair rail needs to be hung, outlet covers need to be put back on and the closet curtain rods rehung- and then those rooms are DONE and ready for carpet…and then they’ll officially be FINISHED. I still need to do my fancy caulk edge around all of the trim, but WHEW what an accomplishment! HUGE accomplishment. Jim is TIRED of painting. The main bathroom backsplash was a fairly simple job. We used the Tuscany mosaic tile sets that Costco sells- it was a fairly simple project (simple when you have a wet tile saw!). Tuesday I used the saw to cut the ends straight and piece together the sets- had it all laid out and ready to install. Saturday I mixed the thinset and adhered the backsplash. So here’s the before and after. I still need to grout it- hopefully one evening this week (or Tuesday when I have my sub here). The grout will be bisque colored, so it will lighten it up a bit and blend in with the lighter colored countertop nicely. Ugh. What a project. Took me all day yesterday and all day today to make the cuts and assemble it. 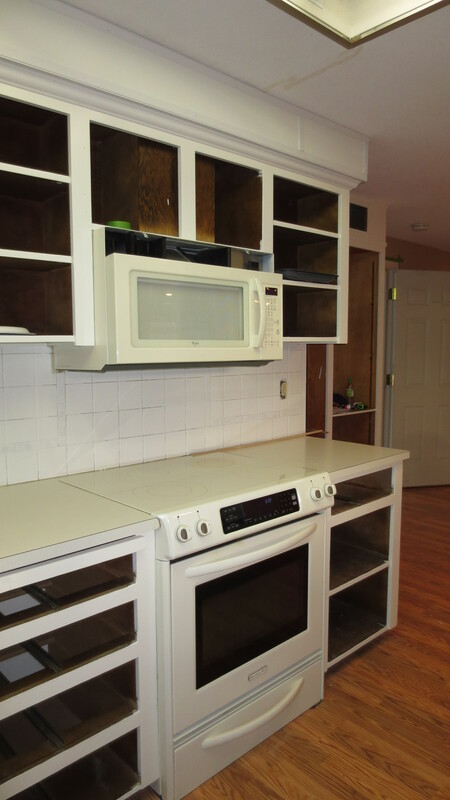 I started out with 4’x8′ sheets of 1/8″ high gloss white wallboard that I had Lowe’s cut for me into 7.5″ strips (8′ long) and a 10.5″ wide strip to cover the wall between the kitchen cabinets and the pantry. I also bought crown moulding, flat trim, and various other pieces of trim. I didn’t take any pictures of the process…. 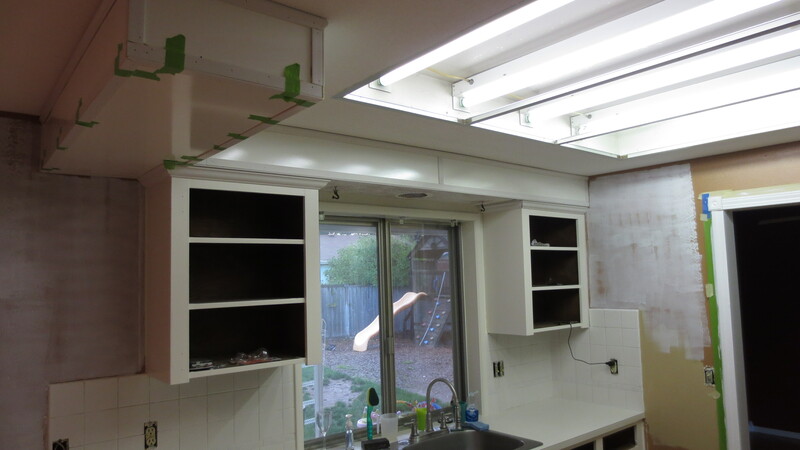 but basically the first step was to cover the soffits with the high gloss wallboard using LiquidNails and real nails. After those pieces were in place I trimmed them out. 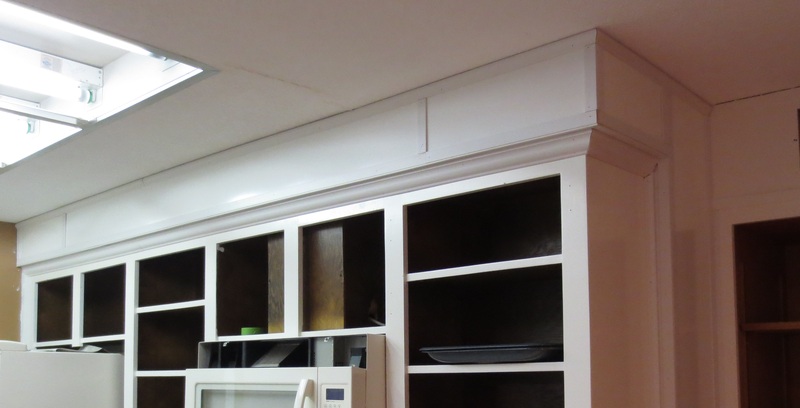 And below the soffit I installed crown moulding so that hopefully the effect is more of a fancy cabinet vs. cabinets hung from a soffit. Yes, there are a billion-and-five nail holes that need to be filled…..and caulking at every single seam, edge and joint. And I have a couple boo-boo spots that will need extra care. But HOPEFULLY when all is said and done (and it’s been painted to match the kitchen cabinets) it will have a seamless looking appearance and be really nice! There you have it! Our “progress” for the weekend. On the one hand we made huge steps forward in finishing off the house…. 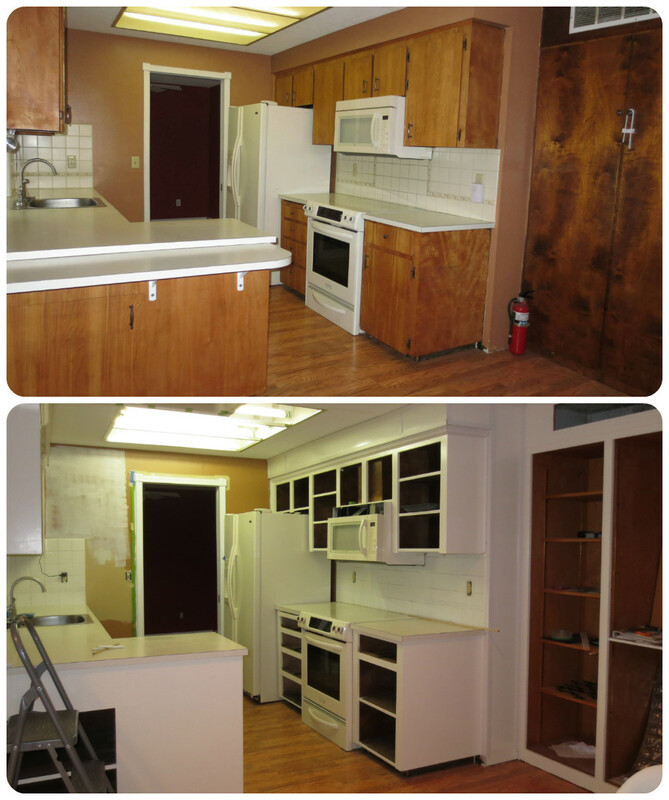 on the other hand I gave myself another 12 hours worth of work filling holes, caulking and painting MORE cabinets! Yikes! Next Next post: 5745 Ramblings: The Finish Line is in Sight!